Staff did a good job obtaining us a scooter for the day and booking our bus to our next destination. The staff seemed friendly, but other than that I wouldn't recommend this place. The staff were really nice and helpful. Even upgraded us to a room with private toilet and bath.the space in he rooms were huge! The wifi worked pretty well and we were able to finish some work. Free breakfast was good, but get there early because it’s premade and only goes from 8-9. 10 minute walk to night market. Very near the night market Hot shower There are many wifi in the hostel so it's always sting connection. Breakfast is free and really fresh hand made dish which you can choose from 5 menus. And you can eat fresh fruit salads. The breakfast was great and we loved eating on the rooftop patio. Very beautiful! Very nice room and bathroom that were clean and neat. Easy 10 min walk to night market. Staff was very nice and even allowed us to lock the motorbike inside during the night. They also spoke fairly good English and are available all the time, so you can always ask if you have any concern. Breakfast was good. I always enjoy some carbs and fruit to start the morning. The location was good. The staff was friendly. They ran the a/c and fans so the dorm with a bunch of bunks was kept comfortable in the heat. The location was about a mile from the main action of the city, like the night market. 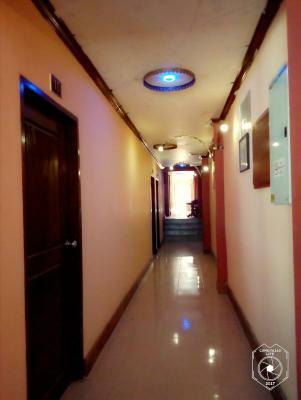 Located inside Khammany Hotel, opposite to the Embassy of Vietnam, Khammany Backpackers offers accommodations with an on-site restaurant. There are both private and dormitory rooms at the property. The private bathroom comes with a hot shower. 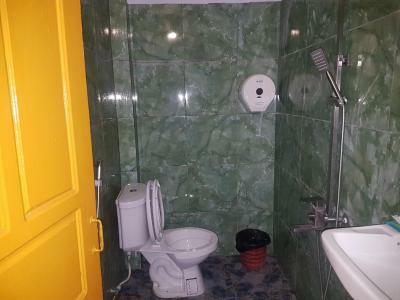 All guests staying in the dormitory rooms will have access to the shared bathrooms. Staff are 24-hour available at the front desk. 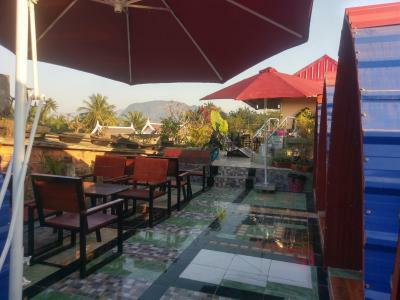 The nearest airport is Luang Prabang International Airport, 1.9 mi from Khammany Backpackers. 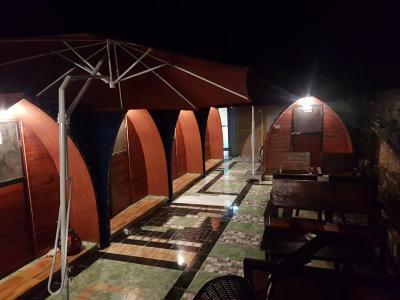 When would you like to stay at Khammany Backpackers? 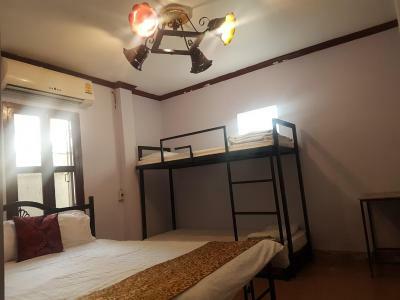 This double room has air conditioning, seating area and toaster. This twin room features a tile/marble floor, stovetop and dining area. This triple room has a soundproofing, electric kettle and kitchen. This family room has a microwave, air conditioning and soundproofing. This single room has a microwave, toaster and soundproofing. This bed in dormitory features a tile/marble floor, soundproofing and stovetop. House Rules Khammany Backpackers takes special requests – add in the next step! Please inform Khammany Backpackers of your expected arrival time in advance. You can use the Special Requests box when booking, or contact the property directly using the contact details in your confirmation. The staff and owner, Ali, are really nice! They make you feel like you’re staying at a friends place. The location is good because it’s just off the Main Street so you can grab live a bit more like a local. Beds were slightly hard and our room (downstairs) became quite stuffy even with the fan. Adding the sliding mosquito nets just to the windows would be amazing because then we could’ve let the fresh air through overnight! Also main door is locked at 11.30pm which is ok but perhaps could be later given the bars closing time is strictly 11.30pm maybe 12midnight would be better. None of this would stop us staying again. The staff are friendly and helpful. Location is good, not too far to walk to the centre and night market etc. Good value for money, especially with the simple but yummy free breakfast served on the rooftop each morning. The owner very kind, helpful and can speak english/japanese perfectly ! Can rent motorbike here, no problem with. Rooms are clean, air condition included, quiet. Free breakfast every morning for customers. Staff were very polite and very welcoming. We are English and were able to communicate. We enjoyed all aspects of our 2 night stay. Breakfast good. Also ate several meals. Even better! Delicious food. Lovely flavours and great prices. This is a newly built contemporary style hotel that meets all modern standards and expections. Real value for money in all aspects. Pool is smaller but refreshing. Hotel is 5 minute ride to center of town but still accessible. Hotel provides a free shuttle service to town and there are many low cost taxis to return in easily. Nothing to dislike, happy with everything and hotel was in a local area. The hotel had the nicest and most helpful group of staff. They were always polite, considerate and full of information when you needed. The hotel also provides a free shuttle service to a temple near the Mekong. Between the EXCELLENT wifi and the great location, I was able to balance work and play. There could be additional power plugs in the room, but they provide a power strip if you ask. Well.. everything! 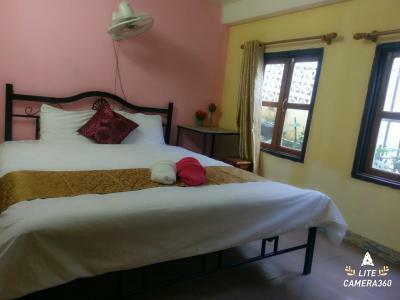 Comfortable beds, clean bathroom, super kind staff, good hot high pressure shower, quiet, good AC, good breakfast (small buffet style (size depends on number of people staying at the moment to avoid food wasting)), good WiFi. And all of that for 25k kips..
very poor breakfast, nothing compared to the picture! small room, door couldnt be fully opened, only one of the showers was warm, no wifi reception in the room, sometimes there was a really bad smell in the room... Also look at the online booking regarding the price, don't believe the staff! 1-The hotel staff sent us a first, courteous, email asking for us to let them know our arrival time. Shortly after this, we received another, less courteous, e-mail asking for our arrival time again, or else the room would be given to someone else. 2-Despite having booked a specific room on bookings.com, the saff tried to put us in the least desirable room of the property. We complained and they handed us the key to the room we booked right away. We did feel that they were trying to take advantage. 3-Our bed was pretty horrible. Springs popping out of their socket and digging into our backs. There was only two toilets in the whole hostel...and they were combined toilet/showers, so if two people were showering, you weren't able to go to the loo. Also less about the hostel itself, more about the owners...we left a nice jacket at the hostel and tried to get in contact to see if it was still there and whether they could send it along with someone, as many hostels have and are willing to do and as we have helped to do also. However, they didn't even reply to multiple emails about whether the jacket was still there, which was very frustrating. Breakfast was great, buffet food and drinks on the rooftop, overlooking the town and mountain. Beds and room were good, we basically had a double bed as all the bunk beds were joined together. But if we weren't a couple and I had someone I didn't know right next to me, would have been a bit awks. Location was pretty decent, five minutes into main town. The biggest minus: there was construction going on, so it was very dusty, even in other rooms and hall, and there was very loud noice starting early morning. Who does that???? Plus, it is next to the main road! The place is definitely overpriced for what you get, since you can find a few other options, just for a few dollars more, and even in a better location!, especially off-season. It's not that far from the city center, just a few minutes walk, but there are better options. Cash only. It isn’t ready yet, there are still a lot of tools around and our tent didn’t have a window so mozzies got in. The glass at the front of the tent is see through, which is awkward if people walk by. There is no internet on the top floor. It just needs finishing off and it would be super! Great accomodation in a good location. Short walk to the night market, which we ended up going to every night during our stay. The rooms were bright and clean. The bathrooms had hot water and were spacious! The property is quite dusty from the work they are doing at the minute and the glasses in the room had never been washed but the staff were happy to change straight away. I emailed ahead and was told I could pay for early check in but that was not the case when I arrived and was left waiting around. The location of the property is good- just a short walk away from everything. The staff were helpful when booking a taxi service and it was nice that the breakfast was added in for free. Shower, WiFi and fridge all worked well and the best was very big and comfortable.